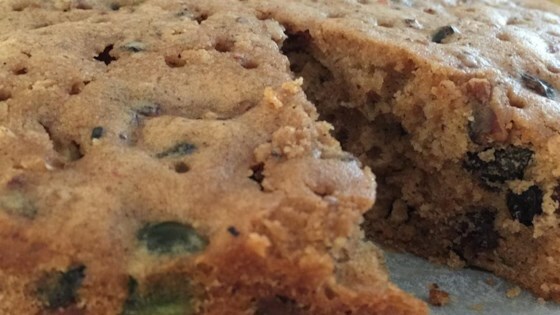 "It's a shame that fruitcake as a species gets such a bad rap. With its two key ingredients--rum and butter--it ought to be a hit. This recipe includes dried fruit, instead of the glowing, candied stuff we've all learned to associate with fruitcake, and is less dense and more cake-like than many fruitcake recipes. It has become a favorite of my friends and family around the holidays (even the skeptical ones), and is delicious by itself, or covered with a layer of almond paste." Preheat oven to 325 degrees F (165 degrees C). Butter a 6x3-inch round pan or loaf pan and line it with parchment paper. I didn't have time 70 days to mature, only 17 days, but the cake came out excellent. My relatives love it. Now I know why the portion is so small, because the cake is so rich! Yum, Yum.